On February 14th, 2018--a high school in Florida faced the ultimate test in humanity. Acclaimed director Charlie Minn brings attention to the victims of the infamous massacre that occurred on February 14th, 2018 at Marjory Stoneman Douglas High School. A normal day at school became a true nightmare for Parkland, Florida citizens as they experienced something they had never thought would happen in their small suburb. In just six minutes, seventeen students and staff were fatally shot and seventeen more were wounded, while innumerable lives were changed forever. The true heroes of that day have come together to tell their stories and to bring words to those who are no longer here to offer them. This documentary reveals testimony and the raw emotions of those involved, highlighting the actions taken by individuals to save the lives of others through selfless and brave acts. Home video release timed to coincide with the one year anniversary. Chilling, informative and respectful documentary has already received national press coverage in The Washington Times, MSN.com, The Miami Herald, The Charlotte Observer, NBC News, CBS News and more! 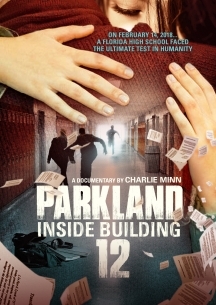 The first documentary about the Marjory Stoneman Douglas High School shooting is an informative look one of the worst mass shootings in American history.